The 2012 Nissan Cube became quite popular in Japan, before it was launched in the US in the middle of last year. The car derives its name from the cubical shape of its body, which is the first thing anyone will notice when he/she sees the car for the first time. The Cube was launched by Nissan to have its presence in the affordable small car segment for budget customers. It falls in the same category as the Kia Soul, Scion xB and Honda Fit. The 2012 Nisan Cube is powered by 1.8 liter four-cylinder engine which gives out a peak output of 122 HP. The power is meager, but it is not all that bad for a car its size and weight. The engine has been mated to a standard 6-speed manual transmission, while an optional continuously variable automatic transmission has also been provided. 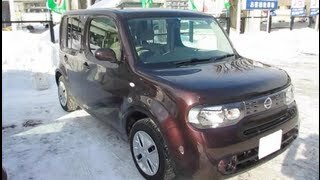 But, what separates the 2012 Nissan Cube from its predecessors is the new package where the car gets a completely new navigational system along with things like Nissan Intelligent Key, Rockford Footage Stereo, 15-inch alloy wheels and a backup camera. The Nissan Intelligent Key is now a standard feature on the SL variants. Light gray or graphite interior color options impart a certain amount of oomph factor to a rather boring car. Things like power windows and remote keyless locks are standard features of the 2012 Cube. Other features on the Cube include manual air conditioning (automatic air-conditioning optional), steering wheel mounted audio controls with iPod/USB ports etc. Bluetooth connectivity is another optional feature of this vehicle. The car comes with safety features such as Anti-lock brakes, Electronic stability system, Active Front Head Systems, seat mounted side impact airbags for front seats and side curtain airbags for all the seats. 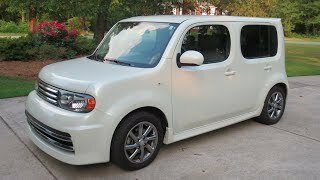 The price of the 2012 Nissan Cube starts from $14,980 in the US and it can go up to $18,520 depending on the features you choose to have in your car. The innovative Nissan cube® enters its fourth year of availability in 2012 with its standout styling and roomy cabin firmly intact, maintaining its unique place in the automotive world. It again offers an asymmetrical rear window, refrigerator-style rear door, space for five in its lounge-like interior or 58 cubic feet of cargo room, and more than 40 accessories to help buyers customize cube to their precise tastes and needs. Enhancements for 2012 include a new 1.8 S Indigo Limited Edition Package with a unique Indigo seat trim color, Nissan Navigation System, RearView Monitor, Rockford Fosgate audio, Nissan Intelligent Key® and 15-inch aluminum-alloy wheels. Other changes include the addition of the Nissan Intelligent Key® as standard equipment on SL models and an attached front passenger seat armrest on S and SL models. Five new exterior colors are also offered for 2012 – Pearl White, Brilliant Silver, Gun Metallic, Cayenne Red and Bali Blue. The 2012 Nissan cube is available in three well-equipped models: cube 1.8, cube 1.8 S and cube 1.8 SL. At first glance, the Nissan cube’s appearance seems to embody the simplistic nature of its name – a box on wheels. But a closer look reveals a more complex and intricate design with a surprising sense of dynamic movement. With cube’s long wheelbase relative to its overall length (a 99.6-inch wheelbase against a 156.7-inch overall length) and wide track, the wheels, are pushed out to each corner – providing exceptional space utilization and a confident-looking stance that has been compared to a “bulldog in sunglasses.” Along with its stance, cube’s distinctive look is aided by the wide headlights and grille treatment, the small but substantial body proportions and the short “tail” section. The Nissan cube is available in eight mild-to-wild exterior colors: new-for-2012 colors Pearl White, Brilliant Silver, Gun Metallic, Cayenne Red and Bali Blue, along with previously available colors Sapphire Black, Golden Ginger, and Bitter Chocolate. Convenient storage spaces and cup/bottle holders are abundant throughout the cube interior – including six cupholders (instrument panel, front center console and rear armrests) and five bottle holders (door panels and center console). There are also detachable multi-hooks for holding bags or hats, which can be moved to other places including the instrument panel and rear passenger doors. “Shelves” are located on the top center and the passenger side of the instrument panel. Although the shelves are not designed for holding objects when cube is in motion, they provide convenient spaces for placing keys, cell phones or digital music players when cube is parked. The Nissan cube interior design also incorporates a series of subtle “Water Drop” concentric circles. Inspired by nature and the calming way that ripples move outward from a drop in water, the circles can be seen in items ranging from the roof headliner to the cupholders to the climate control design. The 2012 Nissan cube includes standard power windows with driver’s side one-touch auto up/down feature, Remote Keyless Entry system, power door locks with auto-locking feature, rear window defroster with timer, cargo area hooks, and 12-volt power outlet and adjustable front seat belt upper anchors. Available cube technology features include Nissan Intelligent Key® with Push Button Ignition, Bluetooth® Hands-free Phone System, Rockford Fosgate subwoofer and amplifier with six upgraded speakers, XM® Satellite Radio (XM® subscription required, sold separately) and Interface System for iPod®. The Nissan Navigation System with 5-inch color touch-screen, XM NavTraffic® capability (XM® subscription required, sold separately), and USB connectivity are available with the cube SL Preferred Package or new 1.8 S Indigo Limited Edition. The cube interior is offered in two color environments, Light Gray and Black. Light Gray, available in a quilted suede-like fabric with special “natural wave” stitching only, is designed to create a relaxing contrast between the warm, light gray upholstery and off-black interior accents. The Black interior, available in two cloth grades, provides a combination of relaxation and more traditional “driving enjoyment” attitude. The 1.8 S Indigo Limited Edition includes Black/Indigo cloth seat trim. Cube combines an advanced 122-horsepower 1.8-liter DOHC inline 4-cylinder with a choice of Nissan Xtronic CVT® (Continuously Variable Transmission) or 6-speed manual transmission for good acceleration response, smooth operation and fuel efficiency. The 6-speed manual transmission is available with cube 1.8 and cube 1.8 S models, while the CVT is available with the cube 1.8 S and standard on the cube 1.8 SL. Engine torque is rated at 127 lb-ft. Fuel economy is estimated at 27 mpg City/31 mpg highway with the CVT and 25 mpg City/30 mpg Highway with the 6-speed manual transmission. Cube’s suspension combines an independent MacPherson strut front design and front stabilizer bar with a torsion beam rear axle with integrated rear stabilizer bar. Its comfortable, flat ride is a result, in part, of the Ripple-control shock absorbers and the high body stiffness. Other standard equipment includes vehicle-speed-sensitive electric power-assisted steering, power-assisted front disc/rear drum brakes and 15-inch wheels with P195/60R15 tires. The 2012 Nissan cube is offered in three well-equipped models: cube 1.8, cube 1.8 S and cube 1.8 SL. Two option packages are offered – the SL Preferred Package and new Indigo Limited Edition. The SL Preferred Package includes the Nissan Intelligent Key® with Push Button Ignition, fog lights, Nissan Navigation System with 5-inch touch screen display, USB connection port, RearView Monitor, upgraded speakers, Rockford Fosgate subwoofer and amplifier, and XM® Satellite Radio (XM® subscription required, sold separately). The 1.8 S Indigo Limited Edition includes 15-inch split 6-spoke aluminum-alloy wheels, Black/Indigo cloth seat trim, Nissan Intelligent Key® with Push Button Ignition, Nissan Navigation System with 5-inch touch screen and XM NavTraffic® capability Radio (XM® subscription required, sold separately), RearView Monitor, six upgraded speakers, Rockford Fosgate 8-inch subwoofer and amplifier, XM® Satellite Radio (XM® subscription required, sold separately), and USB connection port for iPod® and other compatible devices. More than 40 individual accessories are offered – ranging from a unique 20-color interior accent lighting kit and shag dash topper to aerodynamic body kit and unique wheels – allowing Nissan cube owners to personalize their vehicles to reflect their own tastes and needs. Other accessories include illuminated stainless kick plates, rear cargo area organizer, interior trim appliqués and more. Four Accessory Packages are also available, which combine a number of popular features: Interior Designer Package, Interior Illumination Package, Sport Package, and Exterior Accent Package.